We are a friendly and hospitable group of Christians who meet to worship God; to seek his wisdom, love grace and mercy not just for ourselves but for all, as we long to see the people of Pudsey knowing the saving love of Jesus for themselves. We are members of the Baptist Union of Great Britain and Ireland and the Yorkshire Baptist Association. 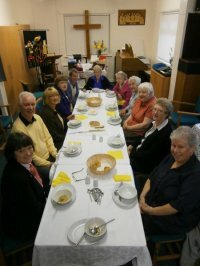 We are members of Churches together in Pudsey, working with and for Christ in Pudsey. We are a Fairtrade Church committed to working with partners to ensure that all growers, manufacturers, employees and distributors receive a fair price and pay for their goods. We stock and use a number of Fairtrade goods. The stall is available to customers, on Monday and Saturday mornings.